“What are you talking about?” my husband asks. “Can we go look?” my son asks. As we walk we see a young girl in the distance-a wee speck on the horizon. 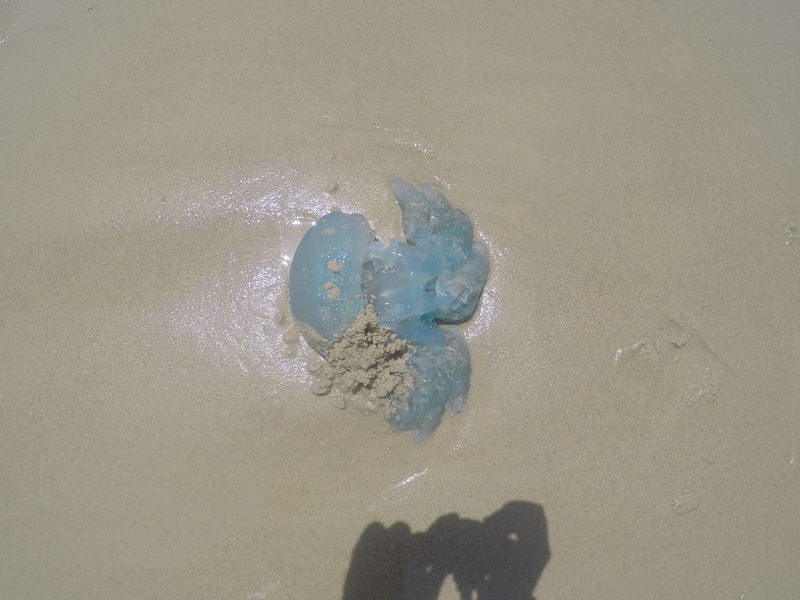 She reaches down and picks up one of the blue blobs with her bare hands then tosses it into her sand castle bucket. As we get closer I see she can’t be more than four years old. She’s surrounded by older brothers-not parents. 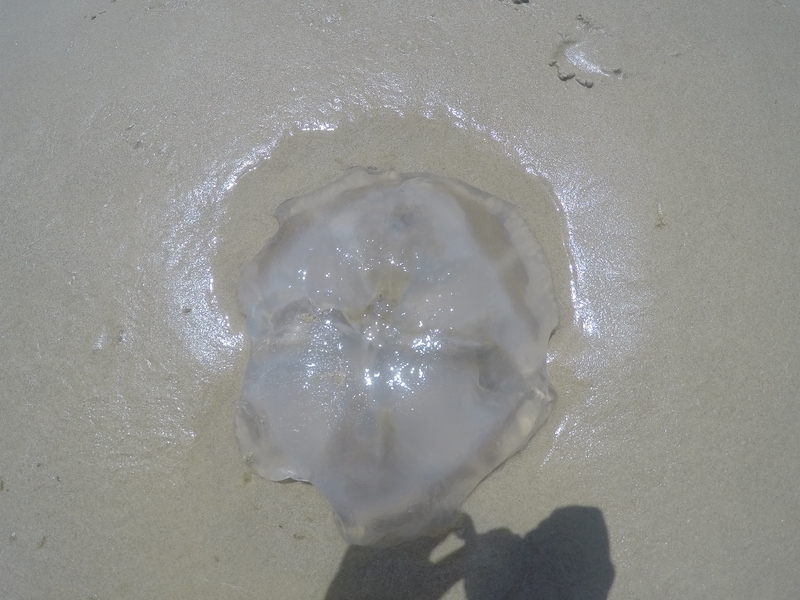 I fight the urge to run towards her in Chariots of Fire style slow motion and yell, “Nooooooooooooo!” as she wanders over to pick up the jellyfish you see below. It’s the size of an extra large pizza. She has drawn a small crowd; from the strained looks on their faces, they fight the same urge I do. She motions up the beach a bit where we spot her ‘jelly’ graveyard, “Look! Those jellies have lost their sting-ahhs!” she says with great confidence. Yet, no adult on the beach will go anywhere near these jellies, nor do they seem to approve of the little croc hunt-ah’s collection methods. “Is this your little one?” I ask. 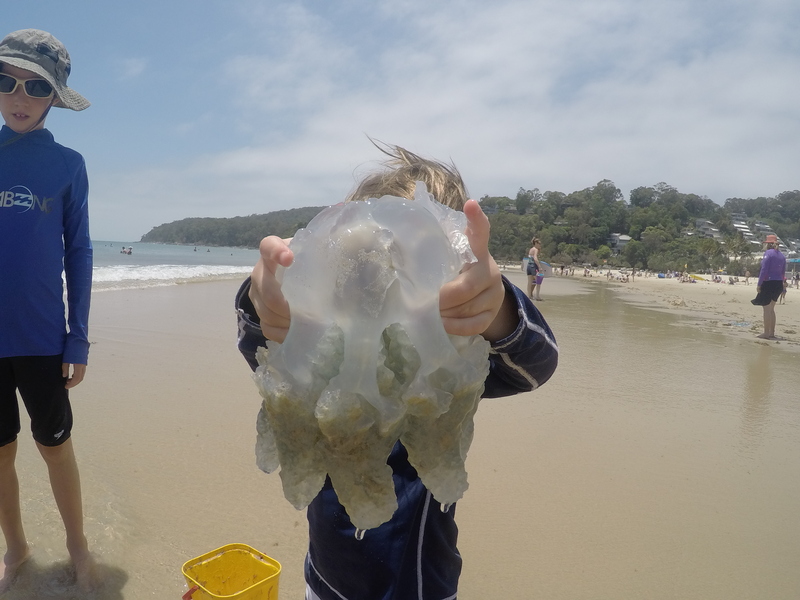 With this more official sounding news, our son now wants in on the jelly hunt. We oblige. 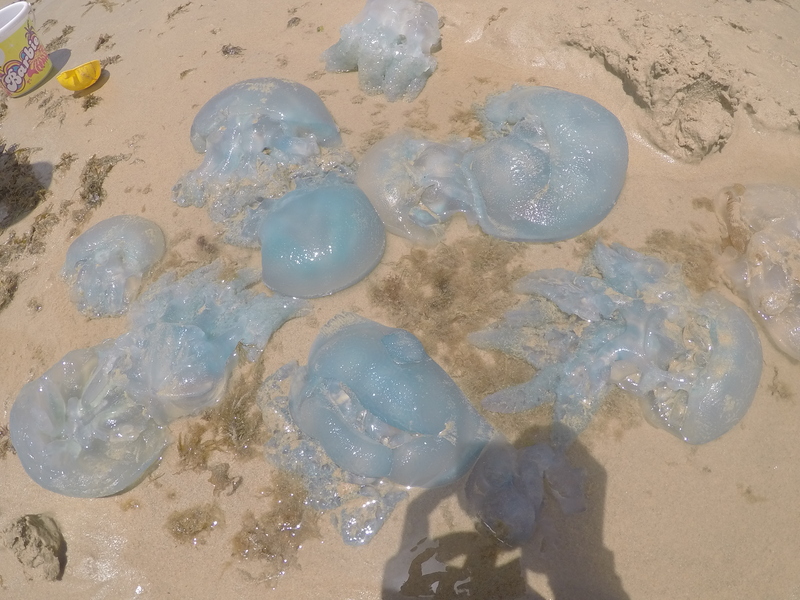 When I sat down to write this post, I thought I’d look up the story of these jellyfish myself. 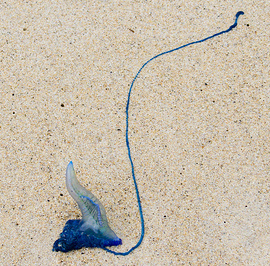 It turns out, Blue Blubber Jellyfish (their scientific name) don’t actually have stingers to lose. What they have, are hundreds of tiny mouths on those chunky legs of theirs. They sting their prey with multiple venomous bites from these mini orifices. If they come up on shore, it’s because they’re dead. They won’t bite if they aren’t alive-unlike box or bluebottle jellyfish. The latter defend themselves from beyond the grave with enough venom in their dead tentacles to paralyze a horse. However, if you find yourself swimming with Blue Blubbers, beware. While the bites won’t kill you, they can be itchy to some and a little rashy to others. You won’t know if you’re the allergic one (surely that’s me) until you get stung and big welts hang around for months. The moral of the story is, Australians have such a weird variety of creatures to deal with they only commit to memory the ones that will kill you. All the rest? Toss ’em around like footballs.